I wish we could sit and have a brownie together. Maybe with some pumpkin hot chocolate. OMG does that exist? One fudgy chocolate brownie for 139 calories? I’d say that’s completely worth it. Plus, good ingredients = good nutrition. By the way, if you’re a fan of frozen or cool treats (like Reese’s PB Cups), then I suggest popping these in the fridge or freezer once they’re cool. I love mine cold! If you want to make these a little more decadent, drizzle warm peanut butter over the top and sprinkle with sea salt. Yeah, HEAVEN. Decadent fudgy Peanut Butter Chocolate Chip Brownies made without flour! Gluten free & vegan. You won't believe how delicious these are! Preheat oven to 350 degrees F. Spray 8x8 inch pan with nonstick cooking spray. In a large bowl of electric mixer or food processor, cream together peanut butter, honey, vanilla and applesauce until smooth. Add cocoa powder, baking soda, and salt; mix again until smooth. Gently fold 1/4 cup of chocolate chips into batter. Pour batter into prepared baking pan and smooth top. I usually spray my spatula with cooking spray to help spread it out evenly. Sprinkle remaining 2 tablespoons of chocolate chips over the top. Bake for 18-22 minutes or until top is just set. 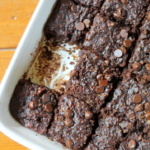 It's okay if they look a little underdone; we want these to be fudgy! Plus they are vegan so you don't need to worry about them cooking all the way through. Cool on wire rack as long as you can. Cut into 12 delicious squares! These are awesome cold or frozen, too! If you want to make these a little more decadent, drizzle warm peanut butter over the top and sprinkle with sea salt. 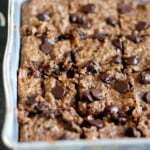 93 Responses to "Vegan & Gluten Free Peanut Butter Chocolate Chip Brownies"
These look soo good it’s almost hard to believe they are healthy. Can’t wait to give them a try! They’re not healthy… They have 10g of sugar per serve. That’s a lot of sugar. Lol. I’m sure they are delicious though for a treat! It’s unrefined. Saying it ils unhealthy is like saying eating too many apples is bad because it makes for too much sugar. healthy? what nutrition, except a tiny amount of protein ? they are high in fat, sat fat, carbs, sugar and cals . that does not constitute healthy. No doubt Monique makes amazing recipes that most of us didn’t think of. Most of us health watchers look for something we can enjoy without feeling guilty of it containing so much calories, sugar and processed fat. Most of the ingredients in this recipe are natural. 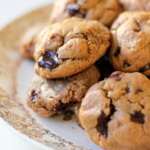 It’s true that it has a bit more sugars and fat but if you want to go super healthy you can take out the chocolate chips and substitute the sugars with bananas for instance instead of moaning that it contains lots of sugar. Plus this is something you eat once/twice a week if you are really a health and fitness freak. The ingredients Monique uses are pretty simple and they make things taste great plus the fact that there’s no flour and butter involved and trust me it makes a difference! This recipe is worth a try! I’ve already tried making one of her recipes – Peanut Butter Oatmeal Chocolate Chip Cookies and they were amazing “thumps up”. Monique I can’t even believe these – WOW!!! Vegan, GF, no weird ingredients, no beans (thank you LOL), amazing stats AND they look like they taste out of this world. Pinned! Congrats on your new place, new couch, etc. I just moved 4 weeks ago and yes, WHAT a chore. Glad you’re in and getting settled! OMG! I'm drooling! Doing the sums to see if I have everything in my cupboards at home to make these brownies tonight!!! Holy fudgeness! You are so inventive.. can’t believe there is no flour in these. I like the idea of eating a frozen brownie, will have to try that next time I bake a batch. They look delicious and love the flavour combination. Oh my goodness!!! These look so moist and amazing! Oh the joy of moving, hope you get settled quickly! They sound and look delish! How many brownies do you cut in the 8×8 to get the correct nutritional info for 1 brownie? Looks good to me. Good luck getting all settled into your new place. Thank goodness for coffee shop wi-fi! Saw this on Pinterest and about died. This looks so good! Thanks for taking the time to share with us, because I am craving some now! And seriously, you should make pumpkin hot chocolate. 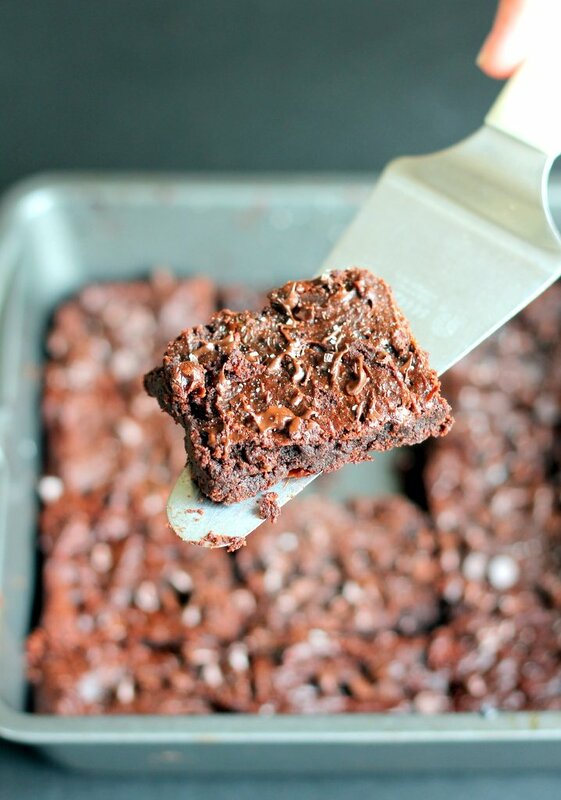 Sounds incredible with these brownies! These look insane! Cannot wait to try them… You think they would be just as good with almond butter? Yesssss please! These sound super scrumptious! I have to make these! They look so good and tick all the boxes for me in the 'foods to avoid' list. Thank you for posting this! Just made these!! SO good!! 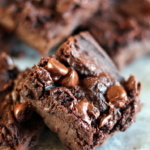 Hits the brownie craving right on! My boyfriend even liked them- typically hes not a lover of my healthy desserts. Nice work lady!! These look amazing Monique!! I can’t believe these are gluten free and vegan! Wow! So busy, but exciting! I know cooking/baking is like therapy. I find myself in the kitchen almost every weekend. Keep enjoying your busy life. One day you’ll be busy with husband, kids, work, homelife, etc. = ) Thanks for the recipe! I went gluten/processed sugar free a while ago and it is SO WONDERFUL to read your blog. I have missed baking so much and I can’t wait to dive into all these fabulous recipes! Thanks! This recipe looks great! But I noticed you tagged this as paleo, and peanut butter is actually not paleo. I imagine almond butter would be a fine sub. I don’t want to sound nitpicky here–just thought you’d want to know! I’m aware, thanks! 🙂 I should put in the notes that to keep them paleo you should use another nut butter. Yum!! 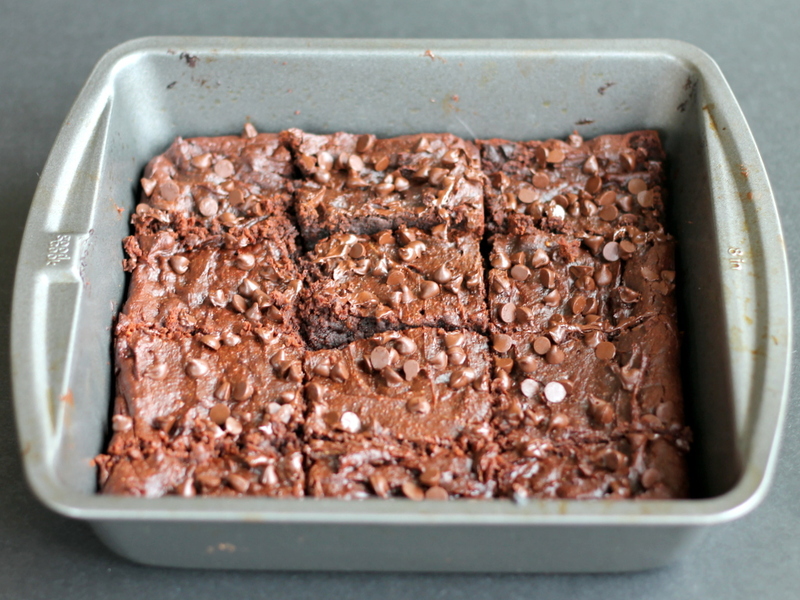 I just blogged about a disappointing brownie experience, I will have to try this recipe instead! I love a good fudgy brownie! These look amazing and I love that they are flourless and gluten free for my friends that have to eat that way. Must you add baking soda? I dont have any on hand. Is there a substitution? This has become my favourite brownie recipe! I was just wondering if I add 1 teaspoon of peppermint extract, would these turn into delicious mint brownies? So I added 1/4 of a tsp of peppermint extract to my batter and they came out just wonderful! It did make them a little less sweet and a little more bitter though (almost too bitter for my taste), so next time I will probably only add 1/8 of a tsp, or add more honey and they’ll be perfect. Best brownie recipe ever! These were delightful. I substituted sunflower seed butter (had to use it up 🙂 and dried cherries for chocolate chips. Yum!! I just found your blogo many yummy things to try! Thanks! I just finished making these. The sugar content may look high but it is the maple syrup, not cane sugar or refined sugar so the sugar content is of a healthier type. If you go to or practice Weight Watchers diet the point count on these is 4 points per piece. You want less points just cut your portion in half. A winner and am going to tell others about this. Thanks for including the nutritional information. Very helpful. I am also diabetic so the lack of flour, sugar, and eggs makes this ideal. Made a batch tonight with maple syrup (was out of honey and could not wait to make these). Unbelievably good. Can this be done without peanut butter? What can it be substituted with? I made these brownies today, and they are really dense and the texture seems off. They feel dry to the bite, but they’re also almost too intensely chocolatey. 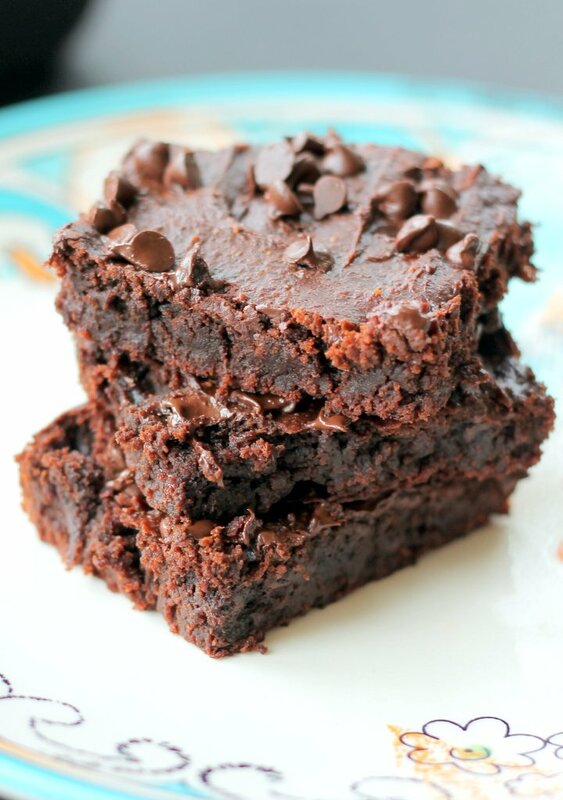 If you want a better gluten free brownie, I recommend the black bean brownies. Sorry you didn’t like them, Olivia! I know lots of people who do, but we’re all different! Oh. My. Goodness. 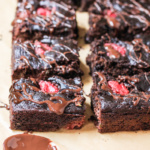 These are so fudgy and delicious, you'll never miss conventional brownies again! I only had 1/4 cup of pb and dark chocolate chips and they still came out fantastic. Thanks for the great recipe! These are SO GOOD. Thank you! Could the applesauce be substituted for anything? Eggs maybe? I know this would make it non-vegan, but I never have applesauce on hand. Hmmm how about a mashed banana? Yummy! I substituted almond butter for the PB and it worked well. 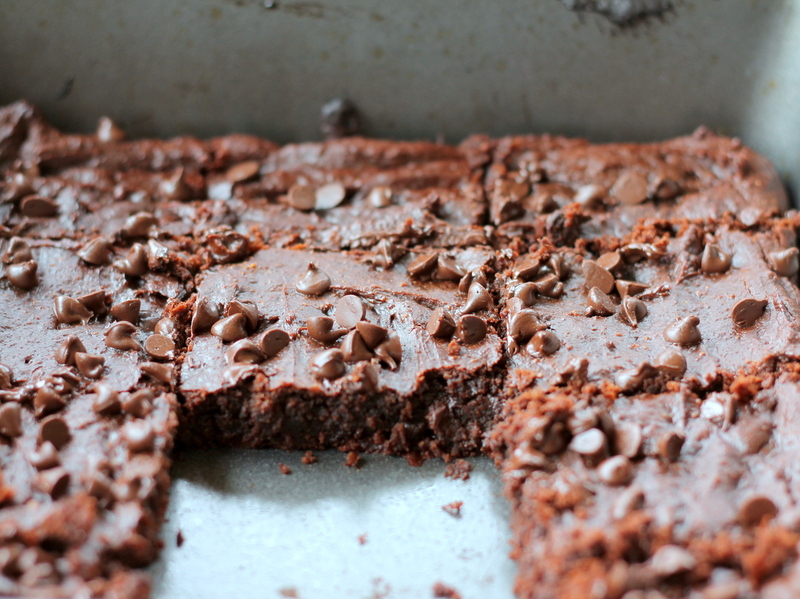 These brownies are SO so delicious! I’ve made them a bunch of times! Sometimes I add a PB swirl on top too..because you can’t have enough peanut butter! Thank you for this recipe! Made these today and love them! Used rice malt syrup as I didn’t have the other sweeteners and it worked really well as it lets the PB and choc flavour come through. Going to make a perfect arvo snack at work. Thanks! Your recipes are always delicious. Thank you so much for the recipe! I just made these last week with my girls (2 and 4) and we all LOVED them! These taste like real brownies and are satisfying. That said, they were gone after 2 days but splitting them three ways, I am okay with that. 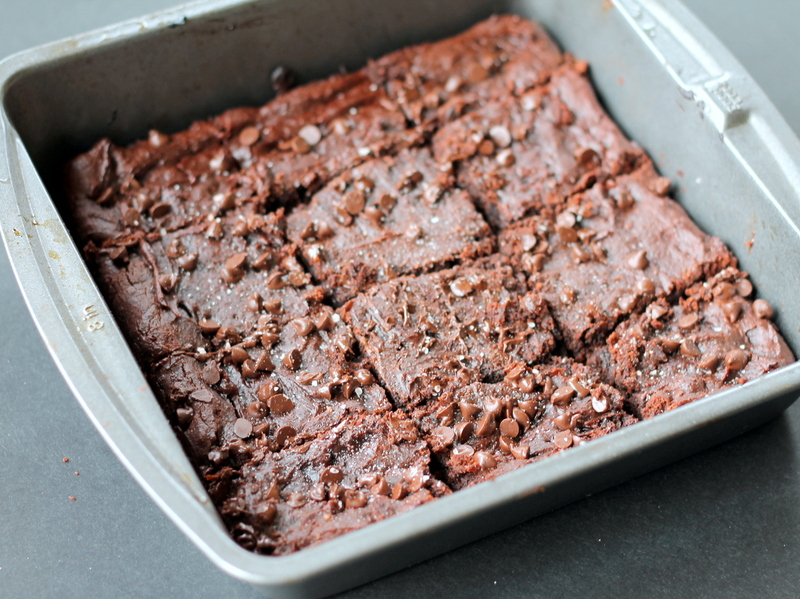 If you want a brownie that you know you won’t feel guilty about eating, make these! They are worth it. Love , Love , Love these and will be making them again today. By the way did I say I love these…not sure I can say it enough. I made these – the batter tasted delicious but they came out a bit dry. Do you think I baked them for too long? Oh no. 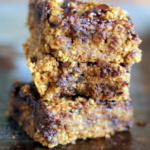 I just made these with cashew butter and they are so decadent. I’m on my second one. Okay, third. 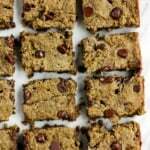 I just made these with carob instead of cocoa and walnuts instead of chocolate chips. They turned out so gooey and scrumptious. I don’t even miss all the unhealthy ingredients, in fact I can hardly tell the difference.